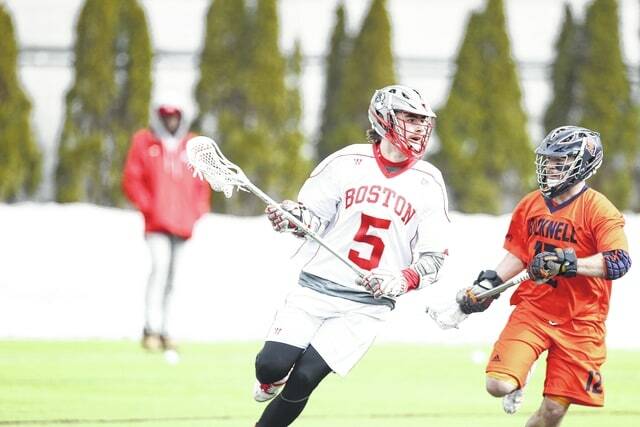 BOSTON — Cal Dearth is a sophomore at Boston University and a key member of the Terriers’ lacrosse team. He is also the grandson of Eaton residents Jim and Virginia Dearth. Cal’s father, Brian Dearth, is also a graduate of Eaton High School. The lacrosse star was named the both the team’s Most Valuable Player and the Offensive Player of the Year. He finished the season with 23 assists and 42 points while also scoring 19 goals on the year. In addition to his offensive prowess, Cal also gathered 25 ground balls and caused seven turnovers. He was the team’s Offensive Player of the Year last season as well. Cal is helping begin a program for Boston University, who just completed their second varsity season in the lacrosse arena. They finished the year 6-8 and came within one game of qualifying for the Patriot League tournament. In March, they also upset Patriot League champion and lacrosse powerhouse Colgate, ranked 18th in the nation, to earn the team’s first ever win over a ranked opponent. Peter Dearth, Cal’s younger brother, is also paving a way of his own on the lacrosse field. He is a junior at Ridgefield High School and just made the US Lacrosse All-America and the Under Armour All-America lacrosse teams.